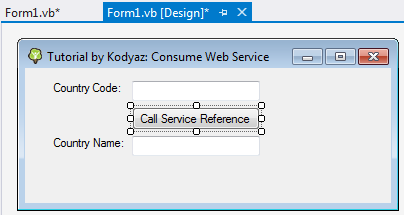 This Visual Studio tutorial shows how to add service reference for a web service and how to consume web service as service reference using VB.NET as shown in sample Windows Forms application project. Web services are very common and Microsoft .NET developers frequently require to consume web services. With the latest improvements, consuming a web service WSDL as service reference is more common. In this VB.NET tutorial, programmers can see how to consume a web service in a Visual Studio project which is added as a service reference and how to code for calling service reference. Finally with sample web service, programmer will be able to see a sample code for parsing response in XML format for the desired values. I'll also share sample codes and sample project showing how to consume web service as a Web Reference in an other Visual Studio tutorial. 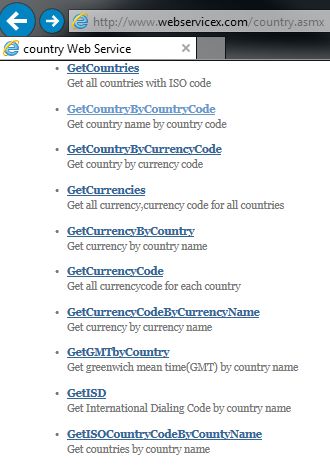 Let's click on GetCountryByCountryCode method which returns the country name for given country code. 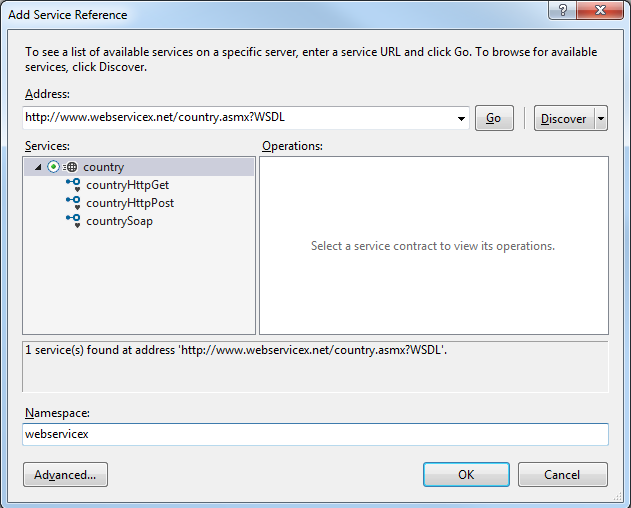 We can test the web service method from URL GetCountryByCountryCode using TR as input country code parameter. Finally press Invoke button to call web service using web browser for test purposes. The inner text of the name node of web service response is showing the country name requested from the service. I chosed Windows Forms Application template for sample Visual Studio 2015 project to consume web service as service reference for this tutorial. 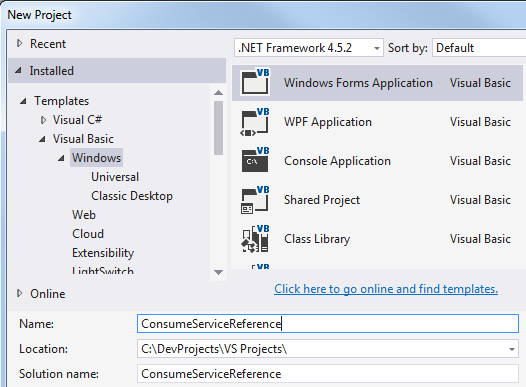 I used the VS2015 project and solution name as ConsumeServiceReference. I arranged the form1.vb as seen in below screenshot. A textbox for input country code parameter for the service reference. A button to launch call to service reference. An other textbox to display service reference output for country name information. 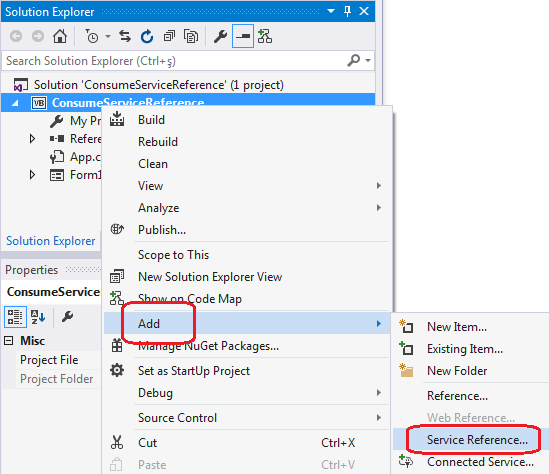 Now .NET developers can add the web service as service reference to their Visual Studio 2015 project. On Solution Explorer windows in Visual Studio IDE, right click on project name. On context menu follow options "Add > Service Reference..." as seen in below screenshot. Let's type some code in VB.NET for our sample Visual Studio project now. 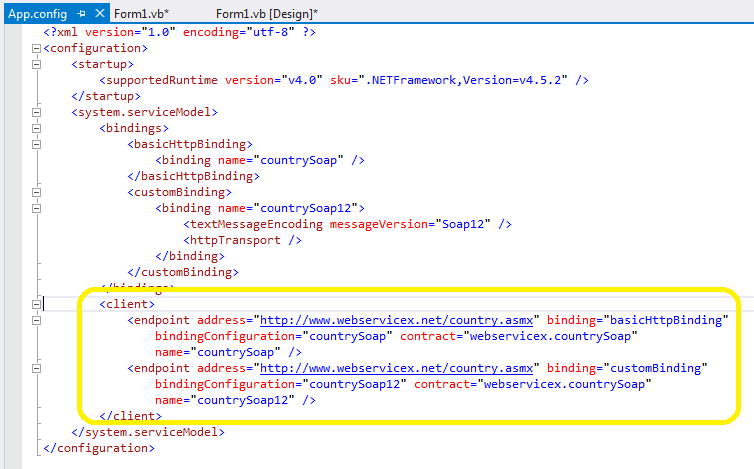 An endpoint configuration section for contract 'webservicex.countrySoap' could not be loaded because more than one endpoint configuration for that contract was found. Please indicate the preferred endpoint configuration section by name. In case you experience error "more than one endpoint configuration for that contract was found", check App.config configuration for service reference. Comment out one of the endpoint definitions. The remote server returned an unexpected response: (407) Proxy Authorization Required. Please note that according to the XML format of the response for web service reference you are using, programmers should change the XmlDocument parsing code blocks for their requirements. For the case in this tutorial, I get the list of nodes according to tag name which has the node name as "name"
Here is the screenshot of the final VB.NET Visual Studio 2015 project for sample input TR as country code and the Turkey as output from Service Reference.